Arniston is a village where time has stood still; where the practices of generations of fishermen quietly continue without interruption. But this sleepy little coastal town has seen its fair share of drama. The name Arniston comes from the British transport/hospital ship that sank near the coast in 1815. The HMS Arniston was carrying 378 pasengers (mainly wounded soldiers as well as women and children) and was sailing from Ceylon (Sri Lanka) back to England when it hit a reef. Only six passengers survived the ordeal. Barrydale is indeed the Gateway to the Overberg and Klein Karoo. Today the timeless countryside charm welcomes you with the friendliness of its people. Sunny days prevail for most of the year, with a little frost in winter. As the valleys are filled to the brim with fertility and the excellent climate, it makes Barrydale a winemakers' dream with premium wines and brandy produced here. 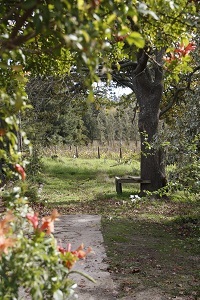 Grapes, apples, quinces and all manner of deciduous fruit also flourish here, as well as sheep and cattle. Betty's Bay is a coastal town situated between Kleinmond and Pringle Bay. Just off the R44 lies the Harold Porter National Botanical Gardens . This piece of land was bought in 1938 to preserve its beauty for future generations. Lovely walks can be taken here and there is also a restaurant within the Gardens that could be visited for light meals or drinks. Kogelberg Biosphere reserve is often referred to as being the 'heart of the fynbos kingdom' and hiking through these mountains you have the opportunity to see 1600 different plant species which can be found within the reserve. Permits can be obtained at the Oudebosch Office in the reserve. A visit to Stoney Point is a must. This is a breeding colony to the Jackass Penguin. You can take a stroll along the boardwalk and watch these cute little birds going about their daily business and if you are lucky you might spot a whale or two. Visit the new Rose Gallery in the main road or take a break at any of the restaurants in the village. 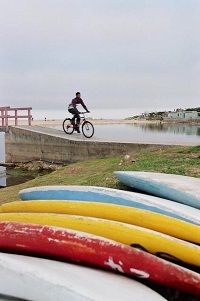 There are many outdoor activities that await you in Betty's Bay and surrounds. These include sandboarding down the magnificent Silversands dune, surfing and swimming, hiking the Leopard's Gorge Trail or up to Disakloof waterfall in the botanical gardens. Angling from the surf or the rocks. white water rafting, tubing and canoeing on the Palmiet River or mountain biking through the Kogelberg Nature Reserve. For further queries, call (028) 271 5138. To the average visitor, Botriver might seem dull and boring, with nothing to do. 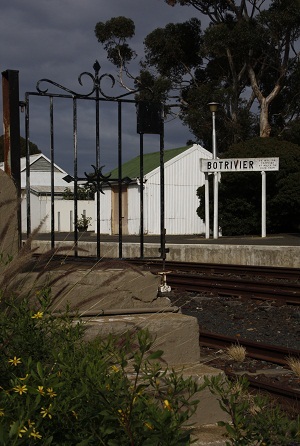 This sleepy little town is bustling with activity: Botriver Hotel is being renovated, there are quiz evenings at the restaurant by the station and sporting action with MTB and trail running events in the area. Besides the horse-riding, and quad biking there are hiking trails. Try the new 4-day Green Mountain eco route, a slack-packing trail with accomodation in guest houses and scrumptioous meals in local eateries. For the less industrious, amble through the vineyards or visit a restaurant or farmstall. Many of the wine estates also offer accommodation, so if you find you have sampled too ambitiously, you can collapse onto a homely bed on the farm. Bredasdorp is an agricultural town in the heart of the Overberg – known as South Africa's first “dorp”. The rolling hills surrounding the town are home to many sheep which are farmed for their wool. Wheat is also farmed on a large scale. The area lays claim to the De Hoop Nature Reserve which covers 60 000 hectares of endangered fynbos. This reserve is home to South Africa's largest population of Bontebok and also the endangered Mountain Zebra. An ideal spot for game viewing and birdwatching (South Africa's national bird, the Blue Crane, can be seen too). Caledon is known as the 'Capital of the Overberg'. Eventhough to some it is a simply another town along the N2, it does lend itself to some extraordinary history. Lying a mere 120 km from Cape Town heading towards George, it owes its origin to the hot water springs on the slopes of the Klein Swartberg. The hot mineral baths today form part of the Caledon Casino Hotel & Spa, an elegant establishment, known the world over for its warm hospitality, well appointed conference centre, a variety of sporting amenities, beauty clinic and excellent personal service. Another asset of Caledon is the world-renowned wild flower garden and reserve famed for its splendid display of wildflowers (up to 135 different species of proteas). Beginning and ending at the garden is an enticing 10 km, 3–4 hour walk that traverses the wider area. Along this walk you will find charming pathways and wooden bridges, lawns, picnic spots, indigenous trees, shrubs and prolific birdlife - you may even be lucky enough to spot the endemic Cape Sugarbird. A wild flower show is held every September. Visit the House Museum at 11 Constitution Street to discover new facts about a past that couldperhaps link you to your family tree. Fly fishermen can enjoy still waters 5 kilometers outside Caledon where the farm also offers many activities for adventure seekers. Among the activities are: trout & carp fishing, 4 x 4 trail, mountain biking, abseiling at the waterfall, hiking on all farm routes, water skiing with own boat and picnicking alongside the beautiful dam. 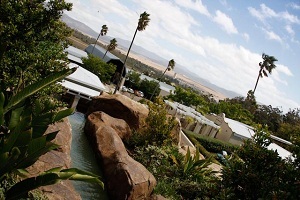 Accommodation in Caledon ranges from hotels, B&B’s, self-catering and award-winning farm accommodation. As you are travelling along the winding road towards Napier through the Overberg, you turn right down a dusty dirt road, heading towards Elim. This quaint little village is found half way between Gansbaai and Bredasdorp – definitely off the beaten track! On entering Elim, the historical charm of the town will be immediately evident with the lime washed cottages and fig trees welcoming you. Danger Point Peninsula - an area ruled by the sea and floral abundance. 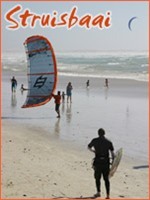 It is here where you will find South Africa's only town boasting the “Big 2”. Between the working fishing village of Gansbaai and the secluded ocean community of Buffeljachtsbaai, there is an area to explore that is full of secret wonders. Gansbaai is an area of contrast. It is situated in the centre of a number of small bays with miles of unspoiled beaches, nature reserves with over 1500 species of Fynbos, ancient Milkwood forests, rocky inlets, caves and spectacular views across Walker Bay. It is a well-known whale watching and great white shark viewing destination. Welcomed by a timeless feeling when entering this town. Of course. This town is almost 300 years old. 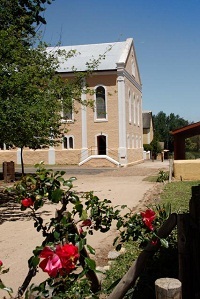 Genadendal ('Valley of Grace') was established in 1738 by missionary George Schmidt, who was sent by the German Moravian Churc to convert the Khoi people. The focus of the town is the museum complex, a National Cultural Treasure which consist of 25 museums. The old buildings are dotted amongst ancient oaks. Sit in the quiet of the grainery, visit the pottery or see how knives are mande by hand. Stroll in the gardens, picnic in the shade of the 200-year old pear tree or book a home cooked meal. The Moravian Church is known for its talented choir and brass band performances. Visit during the Greyton Classis classical music festival. If you are energetic you could tackle the Genadendal Hiking Trail a 25,3 km long circular route. Overnight facilities are available on the farm Die Hoek. A permit could be obtained from the Vrolijkheid Nature Conservation Station. (023) 625 1621. Grabouw is the main town of the Elgin valley, one of the most scenic farming areas in South Africa with a beautiful mountain range and diverse fynbos vegetation. This agricultural centre is home to apple and pear farmers and producers of some stunning cold-region wines. Ideal for pinot noir and Rhine riesling, the sauvignon blancs of this mountainous area are some of the best in South Africa. Apart from indulging in the local viniferous fair, sample brandy at Oude Molen, freshly squeesed apple juice or cider from a farm stall. Fill a picnic basket with freshly baked pies and spread the blanket under a apple tree. Or sample the local cuisine. An outdoor lover? Take a hike. Literally. Grabouw lies adjacent to the Kogelberg Biosphere reserve, the Hottentots Holland Nature reserve, pine forests and farms. There are many trails to pick from, ranging from a few kilometers to gruelling ten-day hikes. The new Green Mountain eco trail is a four-day slack packing route traversing the mountain, fynbos and orchards. Even slower? Play a round of golf, go kajaking or cuddle up with a good book. If you want to go faster - rent a mountain bike or do a quad bike or motorbike trip. Go on a 4x4 adventure. Rent or bring or own vehicle. Trips to the surrounding apple and rose farms can be arranged. Visit the open gardens in November to see stunning rose gardens, take a drive in springtime to admire the soft pinks and white of the fruit tree in blossom or take part in the Oude Molen mountain bike race in August. Dress up in fancy dress and join the Jolly Jester race in December. Slow or fast, lazy or active, wine drinker or gourmand - Grabouw offers it all. At just 90 minutes from Cape Town, Greyton is an ideal place to enjoy a weekend getaway. There are many activities, including hiking (the famous Boesmanskloof Trail to McGregor starts – or ends – in the Greyton Nature Reserve), mountain-biking for the whole family and horse riding. 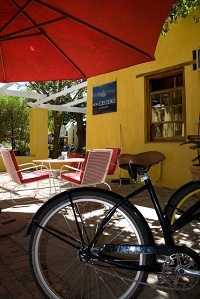 Explore the nearby missionary village of Genadendal or rent a bike and meander around Greyton. Greyton is an artists’ mecca … and foodies are catered for too. There are several wonderful restaurants, as well as interesting little shops selling everything from cheese graters to fabulous handmade chocolates. Cars share the roads with donkey carts and the Saturday Morning Market from 10:00 to 12:00 is a community affair. Visit the October Rose Fair, the Greyton Genadendal Classics for All music festival in June and if you enjoy exercise, the annual Greyton Classic (an MTB and trail running event) or the MTB Greyton Tour are not to be missed. Alternatively you can just stroll the oak-lined streets and breathe. Slowly. Hermanus is built along the beautiful shores of Walker Bay. The official whale watching capital of the world and a popular holiday destination, Hermanus is surrounded by majestic mountains, indigenous fynbos and spectacular natural beauty. Its residents are the heart and soul of the town, however, providing an unforgettable holiday experience. Known as the heart of the whale coast, this coastal resort offers the best land based whale watching in the world. Southern Right Whales visit Walker Bay from July until December every year. Visit the Rooisand nature reserve a few kilometers east of Kleinmond for wild horses and birdlife, go mountain biking or hiking in the Kogelberg nature reserve, stroll along the cliff path or climb Jean's hill. Rent a mountain bike and pedal the flat streets or buy fresh veg or crafts at the market. Cape L'Agulhas is the southern most town in Africa where the Indian and Atlantic Oceans meet. For this reason it is a prime tourist destination. 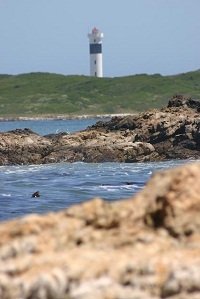 L'Agulhas also boasts the oldest working lighthouse in South Africa, which has an interesting museum to visit. This coastline is extremely ominous and many ships have floundered here. L'Agulhas gets its rich heritage from the shipwreck survivors of many nationalities who settled in this desolate place. The name L'Agulhas means Cape of Needles (referring to the jagged rocks of the coastline and also the fact that a compass shows no real deviation between true north and magnetic north at this spot). This is a sleepy town situated on the banks of the Breede River. Each little house which lines the banks of the river has its own jetty and motor-boat. The river is recognised as the best fishing estuary in South Africa and is also home to an abundance of bird species and wildlife. 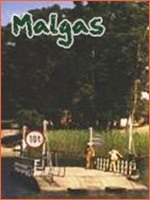 Malgas is home to the only river ferry in South Africa, which serves as a vital link between the east and west bank communities of the Breede River. Taking a trip on this pontoon leaves one with a feeling of nostalgia and also in awe of this incredible river. This beautiful little town was originally seen as an “Afrikaans Dorp” but has in the recent years established itself as an “Artist's Community”- thought of as a “Second-Greyton”. Many of the old houses have been bought by city dwellers and been lovingly restored to their former grace. With its narrow streets and quaint architecture, Napier is a town full of charm. Along the main road you will find many restaurants, galleries and interesting little shops. I would recommend trying some of the local “Patat-koek”, a yummy cake-like pudding made out of sweet potatoes. This peaceful little coastal village is situated just outside Hermanus, a perfect escape from this busy town, but a mere five minute drive away. 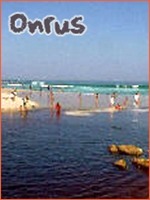 Onrus is called home by many famous artists and authors who revel in the tranquil lifestyle this village has to offer. Nestled between the mountain and the ocean and with the Onrus River flowing into the lagoon at Onrus Beach, this sleepy hollow is exceptionally beautiful with an abundance of wildlife and bird species calling it home. It also beckons the Southern Right whales who visit the ocean meters from shore. The arrival of the whales also brings forth the annual Kalfie Fees in August. A festival celebrating art, music, good food and wine. Pringle Bay is a quiet coastal village in the heart of a UNESCO World Nature Reserve and lies on the coastal route between Gordon's bay and Hermanus. The village is home to artists and businesspeople working in the city and is the access point to the Hangklip are. Hangklip mountain is a beautiful rock feature along the coast and a renowned crayfish diving and fishing spot. Stay at one of the B&B's, walk the sandy beach and explore rockpools and fynbos-covered mountains. The village has some quaint shops, a cookie factory and excellent restaurants. On route to the world famous whale-watching town of Hermanus, Pringle Bay is an ideal place to view whales mating and giving birth during the winter - from June to December. Only 12km away the Harold Porter Botanical Garden is home to a wide variety of fynbos such as South Africa's national flower, the king Protea. The area is renowned for its indigenous fynbos and has more plant species per square meter than anywhere else on the planet. 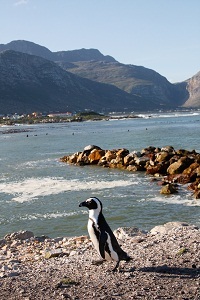 The nearby town of Betty's Bay hosts the Jackass penguin colony. A one hour drive from Cape Town with Hermanus, Stellenbosch and the wineroute 45 minutes away - Pringle Bay is an ideal destination for nature lovers and a perfect base from which to explore the rich and diverse landscape of the Western Cape. Riviersonderend is a small farming community which developed out of a service to the farms in the surrounding area. It has a very peaceful and rural atmosphere with cattle and sheep lazily roaming the green pastures. The mountain water is brown in colour (caused by organic plant material) and originates from the southern slope of the Riviersonderend mountains. It is believed to be the purest drinking water in this country. There are many beautiful walks and hikes to take and nature lovers will delight in the breathtaking views across the valley. Stanford is a historic little village east of the coastal town of Hermanus. It was established as a farming community. The roads are narrow and the majority still gravel. The houses are full of character and many have been restored to their former glory.There are interesting little shops, art galleries and restaurants and on Saturdays the locals sell their produce at the organic market in the centre of town. Visit the Birkenhead micro-brewery for a unique beer tasting and lunch. Take children to the Klein River Cheese, a dairy farm 7 km outside Stanford. They can enjoy the extensive playground and tame farm animals - pigs, goats and fowls while you indulge in a picnic basket, but order adhead. The dairy sells their cheeses and has won numerous awards. There are many adventure tours on offer, including 4 x4 trails, quad-biking, hikes and shark-cage diving in the nearby town of Gansbaai. The Kleinriver passes through Stanford and his home to an abundance of birds and wildlife. There are boat cruises and kayak trips down the river and it is probably the ideal spot for birdwatching. The annual Bird Fair is held in October. Sunset is the ideal time to spot birds and on the Sunset Cruise you can sip a drink whilst floating down the river. Struisbaai is situated just four kilometers from Cape L'Agulhus (the southern most tip of Africa, where the Atlantic and Indian Oceans meet). The beach here is exquisite, with an almost subtropical feel. The water is crystal clear and its brilliant colour is exaggerated by the colourful boats which reside in the harbour. There is a lovely little seafood restaurant at the harbour where you can dine on some freshly caught fish whilst watching the picturesque scene of the locals bartering with fishermen for their daily catch. Struisbaai is believed to have gotten its name from one of three sources. “Straw bay” - because of the thatched roofs of the fisherman's cottages. “Struisvogel”, meaning ostrich, or named after an old Dutch word meaning “huge” - in reference to the size of the beach.There is a 24km sandy coastline extending from Struisbaai to Arniston, named Struisbaaiplaat (believed to be the longest uninterrupted beach in the Southern Hemisphere). There is no doubt that SUURBRAAK on the R324 is one of the most beautiful villages in the Western Cape. It was not called Xairu (“Beautiful” or “Paradise”) by the Attequa Tribe for nothing. 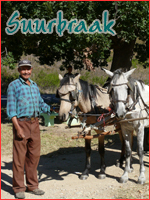 Situated 250km from Cape Town, 20km northeast of Swellendam (N2), 32km west of Heidelberg and 24km southwest of Barrydale (over the magnificent Tradouws Pass) the historical village, with its 3000 residents, nestles snugly under large oak trees next to the Tradouw/Buffeljags River and almost overpowering Langeberg Mountains (1500m). The town was established in 1812 as a missionary station. The people live close to the ground and some still cook on wood stoves. Local Lawn Services are provided by roaming animals…The historical cottages, Information Centre, churches, shops, clinic, Municipal offices, Library, Post Office, Police Station, crèche and Community Hall along the Main Road will always form the backbone of most activities, but the many upgradings and new building projects in the town reflect that more and more jobs are being created by and for locals and nature lovers settling in the side streets. A cheese factory is in the pipeline. Swellendam is a lush town at the foot of the Langeberg Mountains. Many of the buildings in the oak lined streets are colonial and Swellendam is the third oldest town in South Africa. With a moderate temperature the gardens are green and luxuriant and walking through the streets of this town is a joy. The Buffeljachts Dam allows for much entertainment. Taking a sunset cruise on the sparkling water aboard a fully kitted-out double decker wooden raft is an unforgettable experience. A catering service is available and a braai on board can also be arranged. 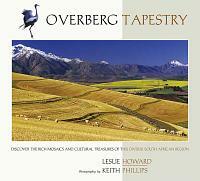 Otherwise know as “The Pearl of the Overberg”. 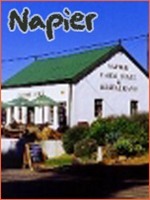 This town was given the name De Villiers Dorp in order to reflect the French influence of its early inhabitants (many were descendants of the French Huguenots). Thus much of the architecture is colonial and the streets are lined with towering oaks and a variety of fruit trees. The climate is Mediterranean and this allows for many outdoor activities and also plays a huge role in the fruit farming industry. This beautiful village is surrounded by orchards and vineyards and is also very near the Theewaterskloof Dam which is a source of endless entertainment. 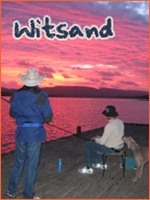 Witsand is a little seaside resort situated at the mouth of the Breede River. It has unspoilt beaches and a small harbour from where you can go sailing or fishing. This is regarded as one of South Africa's top fishing locations and offers spear-fishing, deep-sea and river-fishing, as well as fly-fishing and snorkelling. It is also an ideal swimming spot with 4km of unspoilt beach leading to well known Moodie's Well. Parents with small children prefer the calm swimming areas along the river's banks and can also enjoy canoeing trips and river cruises.